Satan (meaning "accuser") represents the arch enemy of God in the Abrahamic religions, who personifies evil and temptation, and is known as the deceiver that leads humanity astray. The term is often applied to an angel who fell out of favor with God, seducing humanity into the ways of sin, and who now rules over the fallen world. The concept of an anthropomorpized demonic figure (or archetype) is a salient theme in both ancient and modern religions, which ascribe to an ongoing cosmic struggle between the forces of good and evil (stark examples are Manichaeism and Zurvanism). In the religions of Judaism, Christianity, and Islam, Satan represents the personalized power of evil, who, it is said, will ultimately be defeated by the love of God. In popular culture, the term Satan has many synonyms including the Devil, Lucifer, and the Prince of Darkness, among others. The nominative satan in Hebrew שָׂטָן, referring to an "adversary" or "accuser," as well as the Arabic إبليس (shaitan), derive from a Northwest Semitic root śṭn, meaning "to be hostile," or "to accuse." In the New Testament, Satan is a name that refers to a decidedly malevolent entity who possesses demonic god-like qualities. A number of titles in Judaism and Christianity are equated with Satan. For example, Satan is called Diabolos (Greek for "accuser" or "obstructor"), which is the source of the English word "Devil." Satan is also known as Lucifer, based on a reference to the "Day Star" in Isaiah 14:12-14 which "laid the nations low." Additionally, he is occasionally called Beelzebub, meaning "Lord of Flies." Moreover, the titles, "the dragon" and "the old serpent" (Book of Revelation 12:9 and 20:2) have been identified with Satan, as have the terms "the prince of this world" (John 12:31 and 14:30), "the spirit that now worketh in the children of disobedience" (Ephesians 2:2), and "the god of this world" (2 Corinthians 4:4). Satan and the Angel of death and destruction, "Abaddon," are sometimes claimed to be identical. Satan is also equated with "Ahriman," the Persian "Prince of Evil." The angel "Leviathan" is described as "that crooked serpent," which is also used to describe Satan in Revelation 12:9. Satan is primarily understood as an "accuser" or "adversary" in the Hebrew Bible, and is not necessarily the personification of evil that he would become in later Abrahamic religions. Within the Hebrew Bible, the term satan itself is applied both to supernatural entities and human beings. In actuality, the figure Satan is mentioned quite infrequently. Where Satan does appear in the Hebrew Bible it is as a member of God's divine council who watches over human activity, but with the evil purpose of searching out human beings' sins and then registering accusations against them. In this way, he serves as something of a prosecuting attorney for God, presenting his case against humankind in the heavenly court. This is most evident in the Book of Job, wherein Satan questions the veracity of humankind's loyalty to God, putting forth the argument that any given human is only loyal because God gives her or him prosperity. God agrees to put Satan's theory to the test, and various misfortunes are visited upon Job as a test of his faith. It is Satan who actually delivers these ills one-by-one. Despite this activity, the prologue of the Book of Job makes clear that Satan has no power of independent volition of his own, and requires the permission of God to carry out his actions. In other verses, Satan appears to take his own initiative. In 1 Chronicles 21:1, Satan incites David to commit the sin of taking a census of Israel. In this passage, it appears that Satan is actually the entity that enables David to destroy Israel, who acts out accord with the wishes of God. Five hundred years earlier, this same story portrayed Yahweh as the one who incited David to take the census (2 Samuel 24:1). The change in the narrative may be due to the fact that the later story was written after the Hebrews had been in exile in Babylon, where they were no doubt exposed to Zoroastrian influence. Zoroastrianism had developed the concept of a volitional evil deity Angra Mainyu who existed in counterpoint to Spenta Mainyu, the personification of good. The attribution of an independent will to Satan may be a Zoroastrian influence, as Angra Mainyu's predilection to evil exists contradicts the will of Spenta Mainyu and ultimately, the one supreme and exclusively benevolent Ahura Mazda. 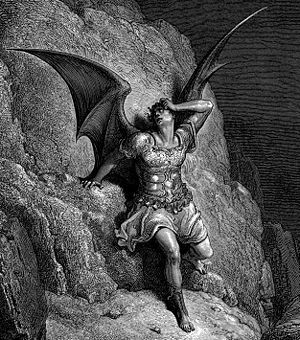 Although Satan's role as the adversary is established in the Hebrew Bible, he had not yet taken on the demonic character of the personification of evil, which he would inherit in later Jewish literature, as well as in Christianity and Islam. Thus the Hebrew word "Satan" is used in a threefold way to refer to those who act as adversaries, either as 1) an enemy in times of both war and peace, 2) as an antagonist who puts obstacles in an individual's way, as in Numbers 22:22, where the angel of God is described as opposing Balaam as an adversary, and 3) as an accuser before the judgment-seat. Early rabbinic statements in the Mishna and Talmud show that Satan played a minor role in early Jewish theology. In the course of time, however, Judaism absorbed many of the now-prevalent concepts of Satan, most likely from the nearby Persians. Consequently, as a rule, Jewish writings tend to contain more frequent mentions of Satan and his hosts. In apocryphal works such as the Jubilees, the Testament of Reuben, and The Book of the Secrets of Enoch, Satan is considered to be the leader of the fallen angels. As Judaism evolved, history began to be conceived of in two ages: the present age, which is marked by Satan's rule, and a more glorious future age which will usher in the rule of divinity. This will only occur after an apocalyptic conflict where Satan and the effects of sin, for which he is responsible, will be overcome. This conception of Satan as the apocalyptic adversary was no doubt influenced by Zoroastrian eschatology, as well as by that religion's ethical dualism. It should be noted that Judaism, as with Christianity, stops short of identifying Satan as a wholly evil being, so as not to compromise its fundamental belief in monotheism. In some Jewish works, rabbis put forth the idea that Satan is the incarnation of all evil, devoting the entirety of his works to the destruction of humankind. The Babylonian Talmud, for instance, states that the Evil Inclination (Yetzer ha-Ra), the Angel of Death and Satan are all identical. Satan is said to seize upon so little as a single word which may be prejudicial to man,  and in times of danger, he consistently brings a barrage of accusations.. By the end of the apocalyptic period (approximately 100 C.E. ), Jewish demonology and folklore had variously connected Satan with darkness, the underworld, sexual impropriety, and animals such as the goat, the frog or toad, and the serpent. Some literature, both rabbinical and apocalyptic, asserted that Satan first wielded his power in the Garden of Eden and this serpent wryly coerced Eve into eating the forbidden fruit. Pirke de-Rabbi Eliezer characterized Satan as an active agent in the Fall of Man, and put forward that he was also the father of Cain Other rabbis have continued this line of thought suggesting that Satan provided the impetus for other negative events in Jewish history. These include the offering of Isaac for sacrifice, the release of the animal destined by Esau for his father, the death of Moses, David's improprietous sexual relationship with Bathsheba, and the death of the Persian Queen Vashti, wife of Ahasuerus (probably Xerxes the First). In addition, the decree to destroy all the Jews obtained by Haman, the scheming grand vizier of Ahasuerus, was said to have been written on parchment brought by Satan. The normative Jewish concept, however, was and remains that Satan cannot be viewed as an independent agent, and therefore could not have perpetrated the aforementioned events. In the Babylonian Talmud, Rabbi Levi asserts that "everything Satan does is for the sake of heaven." Satan's powers are by no means uncontestable; when the Shofar (Horn) is sounded by Jews on New-Year's Day, Satan is said to be "confounded". Further, on the Day of Atonement Satan's power is said to vanish altogether, since the numerical value of the letters of his name (in the context of gematria and Hebrew numerals) is only 359, thus allegedly exempting this one day from his influence. In Christianity, the concept of Satan is the amalgamation of both Jewish and Greek descriptions of evil. In the Christian understanding of the Hebrew scriptures (Old Testament), Satan is understood as an angel who rebelled against God. Before his insurrection, Satan was the highest of all angels, and the "brightest in the sky," referring to his connection (made in Isaiah 14:12-14) with what was called the "Morning Star" in Roman astrology, the planet Venus. However, he sought to rule heaven himself, and his pride kept him from bowing to God as all other angels did. God promptly cast him out of heaven along with one third of the angels, who became demons under his charge. The majority of Christians also believe it was Satan who spoke through the Serpent and seduced Eve into disobeying God. This connection was first made in the Christian tradition by Paul in Romans 16:20, though it was largely dispelled by early church fathers who maintained the traditional Hebrew understanding that Satan fell after Adam. However, in the 3rd Century B.C.E. Origen argued that Satan fell before Adam had even been created, and therefore could have appeared in the Garden. Satan is commonly referred to in the New Testament text by the Greek term Diabolos, from which the word devil derives. This term means by "accuser" and "obstructor" for the Devil is described as hating humankind, and intent on impeding it's spiritual progression by providing temptation to sin. By the 2nd century C.E., the concept of Satan had inherited the characteristics of many ancient destructive nature spirits and ghosts, and became the unequivocal personification of evil. Satan's power was said to extend over the entire physical world as well as a legion of evil demons. However, he was also said to lack the omniscience and omnipotence of the one true God, and therefore relied upon demons to possess human beings and then torment them. Various New Testament stories provide accounts of exorcisms Jesus performed upon possessed individuals, such as Mark 16:9. The New Testament makes the suggestion that Satan does indeed possess his own will, as it has been argued that Satan entered Judas so that the Son of Man could be delivered over to Roman officials for his execution (as in Luke 22:3). However, all throughout the New Testament, the inevitable fall of Satan's rule is prescribed again and again, as in 2 Peter 2:4, and culminates in Revelation 20:2, 7-10 where Satan is defeated by Christ, thrown forever into the "lake of fire." In Islam, the word Shaitan (شيطان) (deriving from the root šṭn ش⁬ط⁬ن meaning "astray" or "distant") is the equivalent of Satan. The proper name al-Shaitan "the tempter" is used to refer to Satan specifically when he is the tempter. Iblis is the personal name of the Shaitan who refused to prostrate before before Adam in the Qur'anic account of Genesis. The name Iblis is likely a contraction taken from the Greek "Diabolos." The Qur'an explains that before the creation of Man, Allah (God) created the Angels out of light. These angels possessed no free will of their own. Allah also created the Jinn (genies), endowing them with semi-free will. Later Allah created Adam, and ordered that all the angels bow to him. All the angels did, except for a Jinn called Iblis, who was elevated to be one of the leaders of the Angels. As with Lucifer in the Christian tradition, Iblis was proud and considered himself to be superior to Adam who was made of modified clay, while he himself was made of smokeless fire. For this transgression, God damned Iblis to Hell for eternity, but gave him respite till the Doomsday at his request. At this point Iblis swore that he would in the meantime dedicate his efforts to lead all men astray. Allah replied that there would always be followers of God, and that the paradise of heaven was available for them, and those who followed Iblis would go to Hell. Some adherents of Sufism, the Islamic mystical tradition, actually interpret Iblis' action against Allah in a positive light, considering his refusal to prostrate before anything but God as the ultimate display of monotheistic faith. After their creation, Adam and Eve (Hawwa' حواء,) dwelt in Paradise (الجنة, Al-Jannah), where Allah forbade them to go near the cursed tree. As in the Judeo-Christian tradition, al-Shaitan tricked Adam and Eve into eating from the tree, at which point Allah expelled all of them from Paradise and placed them upon the Earth. Here Iblis continued his role as the tempter of mortals, trying to influence as many descendants of Adam and Eve to sin, thereby collecting them as companions in Hell. Islamic tradition states that Iblis tempts human beings by being present in the actual flesh and blood of all of Adam's children, that is, within the nafs, or the lower principles of the flesh. Unlike the Christian and Jewish notions of Satan where he dwells in the underworld realm and related to the jurisdiction of evildoings, the Islamic tradition conceives of Satan as a part of all humans, no matter who they are. This may account for the prevalent associations between Satan and sexuality in the Western world. In order to tempt mortals, Iblis can assume any shape, including no shape at all. In one such instance, he took the form of a hatif, one who can be heard but not seen, in order to beguile Ali so he would not wash the body of the Prophet Mohammed. The Bahá'í Faith has attempted to synthesize various texts and precepts of many religions, as well as the figures within them. The Bahá'í teachings reveal that the figure of Satan, prevalent in many religions, is actually a metaphor for the "insistent self," or the self-serving inclination present within each human being. This insistent self is often referred to as "the Evil One." Bahá'u'lláh, the founding prophet of the Bahá'í Faith, once wrote "[w]atch over yourselves, for the Evil One is lying in wait, ready to entrap you. Gird yourselves against his wicked devices, and, led by the light of the name of the All-Seeing God, make your escape from the darkness that surroundeth you." Despite the fact that Satan is addressed in this way, he is not seen as being an independent evil power, but instead as the lower nature present within every human being. Evil, then, is not an entity of itself within the Bahá'í Faith; rather it is the absence of goodness. Consequently, there can be no actual evil entities, Satan included. Gnostic sects sometimes interpreted Satan as a positive figure since he had enabled knowledge to be brought forth, and thusly he was venerated in worship for this deed (see Gospel of Judas). Some Gnostics also claimed that the creator God worshiped by Jews and mainstream Christians had to be Satan, as the highest God could not bring forth a world of such imperfect nature. Adherents of Mormonism believe Jesus Christ and the Devil are actually siblings; Christ is a son of God in the flesh while Satan is His bodiless spirit son. Jehovah's Witnesses accept the mainstream Christian belief that Satan was responsible for the temptation in the Garden, though they believe Satan was at first a real person who was transformed into "Satan the Devil" upon trying to win Adam and Eve's favor for himself. 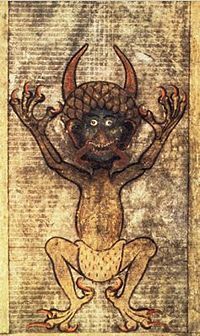 The Devil as seen in Codex Gigas. Satan has most often been portrayed in Christianity as a horned creature, red in color, often having the hindquarters or body of hoofed animals, particularly the goat. These depictions are notable in their resemblance to the Canaanite gods Baal and Moloch, the Greek deity Pan, as well as prevalent conceptions of the major male god in Pagan and Neopagan traditions, such as the "Horned God." According to some Biblical interpretations, Satan was formerly the Angel Lucifer who fell from his exalted status for refusing to honor God. As a result, Satan is often depicted in Christian iconography as having wings due to his former status as an angel. Before his insurrection, Satan was the highest of all angels, and the "brightest in the sky," referring to his connection (made in Isaiah 14:12-14) with what was called the "Morning Star" in Roman astrology, the planet Venus. However, he sought to rule heaven himself, and his pride kept him from bowing to God as all other angels did. After this fall from heaven, Satan is said to have tempted Adam and Even in the Garden of Eden as the Serpentand has since often been represented as a deceptive serpent hiding in the shadows. Satan is often described as residing in Hell, the fiery locale where the wicked are punished after death, however, passages in the New Testament such as 1 Peter 5:8 suggest that he actually roams the earth, seeking to sully the lives of living humans by keeping them distant from God. The Devil has been accredited with the role of bestowing magical powers upon sorcerers and witches. This idea has prevailed since the Middle Ages, when complex demonologies were developed within Christian circles. People claiming to worship Satan follow a wide variety of beliefs. These range from the literal worship of a malevolent spiritual being (also known as Theistic Satanism); to a kind of subversive ritual performance stressing the mockery of Christian symbols (most notably the Black Mass); to the alleged rediscovery of an ancient but misunderstood religion Setianism (which conflates Satan with the Egyptian god Set); to an excuse for hedonistic recreation, and the celebration of selfishness and pleasure. Perhaps the most prominent spokesman for Satanism in recent years has been Anton Szandor LaVey, who founded the Church of Satan in 1966. LaVey wrote The Satanic Bible (1969). He rejected the Black Mass, criminal behavior, cruelty to animals, and any literal belief in (or worship of) Satan. Instead he supported a view that identified human beings as animals and rejected many social structures that inhibit our instincts. Other individuals linked to Satan have been Michael Aquino, founder of the Temple of Set, John D. Allee, founder of First Church of Satan, and Karla LaVey, daughter of Anton Szandor LaVey who carried on the legacy of her father by founding the First Satanic Church. Equally renowned within Satanic circles, though not technically a Satanist, would be ritual magician Aleister Crowley, who referred to himself as "The Great Beast 666." Crowley's maxim, "Do as thou wilt shall be the whole of the law!" captures a common Satanic attitude, and is thought to be exemplified within the myth of Satan's rebellion. Much "Satanic" lore does not originate from actual Satanists, but from Christians. Best-known of these sources would be the medieval folklore and theology surrounding demons and witches, which culminated in the witch hunts, where Christians persecuted any behavior that even mildly resembled their conception of paganism. Many "witches" were killed on the basis of tenuous accusations. A more recent example of this witch hunt mentality was the so-called "Satanic Panic" of the 1980s, which was incited by the memoir Michelle Remembers, co-written by psychiatrist Lawrence Pazder and Michelle Smith. In this book, the authors depict Satanism as a vast conspiracy of elites who have orchestrated an elaborate underground movement focused upon child-molestation and human sacrifice. Such allegations are largely unsubstantiated. Most rhetoric produced by the ritual abuse scare of the 1980s is highly polemical, and regularly suggested that Satan actually appears in proximity to the said crimes in order to receive worship. Actual Satanic crimes do occur from time to time and may involve vandalism, cruelty to animals, or grave desecration. While some high-profile cases of murder or even serial murder have been found to have Satanic themes, such as those which were perpetrated by the Manson Family, these appear primarily to be the works of disturbed individuals rather than those of organized religious groups dedicated to Satan. The Satan which appears in fiction and popular culture is mostly influenced by the Christian conceptions of the devil and other evil forces. Classic works of literature involving the character Satan include: John Milton's Paradise Lost (1667), William Blake's The Marriage of Heaven and Hell (1790–1793), Johann Wolfgang Goethe's Faust (Part 1, 1808; Part 2, 1832), and William Golding's Lord of the Flies (1954). In more recent years, Salman Rushdie's bestselling novel The Satanic Verses (1988) was widely banned in Middle Eastern countries due to the demonic attributes bestowed upon certain characters, and even earned its author a death sentence by the Shi`i Muslim cleric Grand Ayatollah Khomeini (1900-1989). The concept of Satan has also been a recurrent figure in numerous films, particularly those in the horror genre, including Rosemary's Baby (1968), The Exorcist (1973), The Omen (1976), and The Amityville Horror (1979). Satan has also appeared in more mainstream films including, O Brother, Where Art Thou? (2000) and The Passion of the Christ (2004), as well as popular television shows such as South Park. Another prominent source of "Satanic" imagery is the musical genre of heavy metal, which has given Satanism the "Hail Satan!" hand-sign. This hand sign is made when one holds down the middle and ring fingers with the thumb while keeping the index and pinkie raised to resemble horns. ↑ American Heritage® Dictionary: Semitic roots: sn. Retrieved May 31, 2006. ↑ 2.0 2.1 Easton's Bible Dictionary, Satan. Retrieved February 14, 2011. ↑ However, this descriptor may have referred to none other than the King of Babylon himself, who had figuratively fallen from heaven. ↑ This moniker was actually the name of a Philistine god, but is also used in the New Testament as a synonym for Satan. ↑ Satan in relation to different religions. JewishEncyclopedia.com. Retrieved February 14, 2011. ↑ Midrash Pirke de-Rabbi Eliezer 13. ↑ Midrash Tanchuma, Wayera, 22. ↑ Rosh Hashana 16b, Targum Yerushalmi to Numbers 10:10. ↑ Iblis swears an oath Surah 38.082. Retrieved February 14, 2011. ↑ "Bahá’u’lláh Revealed After the Kitáb-i-Aqdas." LAWḤ-I-DUNYÁ (Tablet of the World) Retrieved February 18, 2007. This page was last modified on 20 August 2015, at 19:16.